Pattern: Based on the Moiré Skirt, from Norah Gaughan’s Knitting Nature: 39 Designs Inspired by Patterns in Nature. When I first saw the skirt, I was unimpressed: I just could not see the moiré because of the busy yarn (Berroco Zen) Norah Gaughan had chosen. Then I saw the skirt on Ravelry, done in a smooth yarn, and I could finally see the beautiful “interference” pattern. Yarn: Woolen-spun, 2-ply, worsted weight cormo from Elsa Wool Company, in medium grey. A lovely, rustic but soft yarn from an independent producer in Bayfield, Colorado. Someday I am going to do a road trip to that corner of the state. 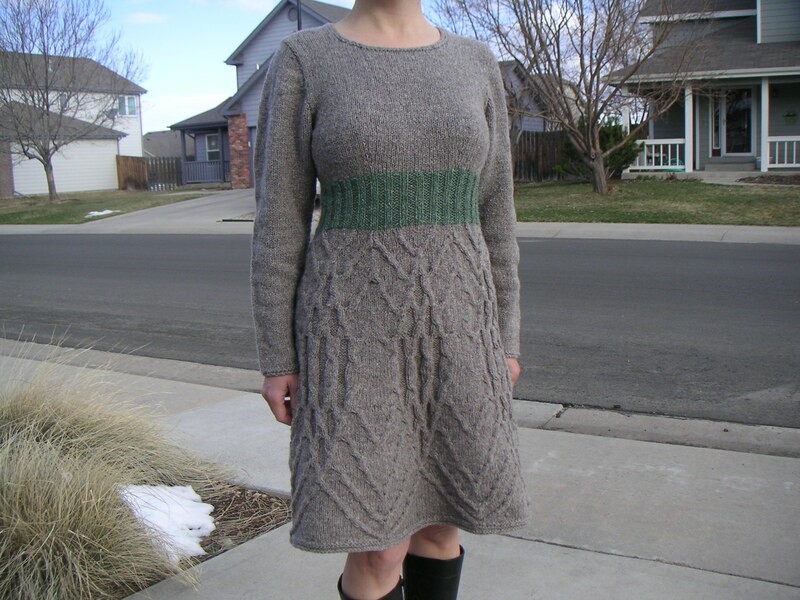 Modifications: It is part of my continuing obsession with knitted dresses . . . . The skirt part is unmodified except that I knitted it in the round, did the waist in a 2 x 2 rib in a sage-colored yarn left over from another project, and winged the bodice and sleeves. The sleeves were picked up from the top and knitted downwards, the caps shaped via short rows. And because I did not calculate the sleeve shaping, they are roomier than they need to be. Thoughts: Norah Gaughan’s interpretation of the moiré concept makes for a truly unique cable pattern. Hurray for knitting geeks!